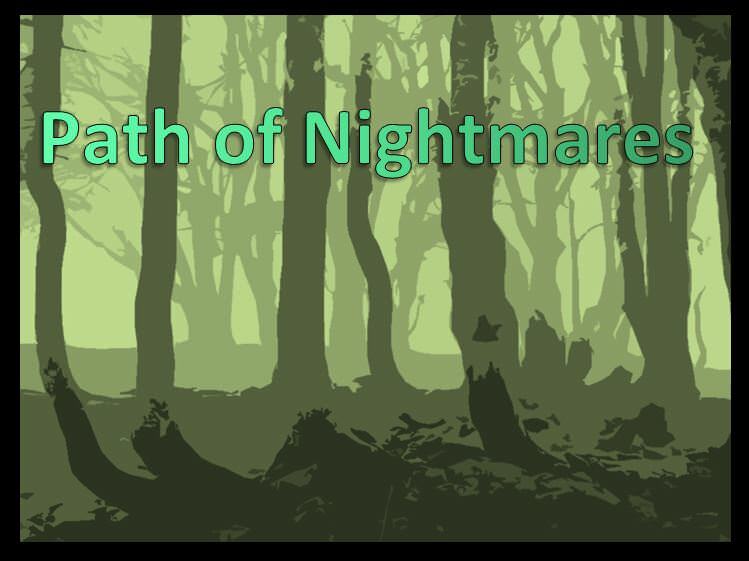 Raftol is part of the Path Nightmares Adventure being used by the Companions of the Silver Apple campaign. The Companions are the house D&D group of the Toylab blog. 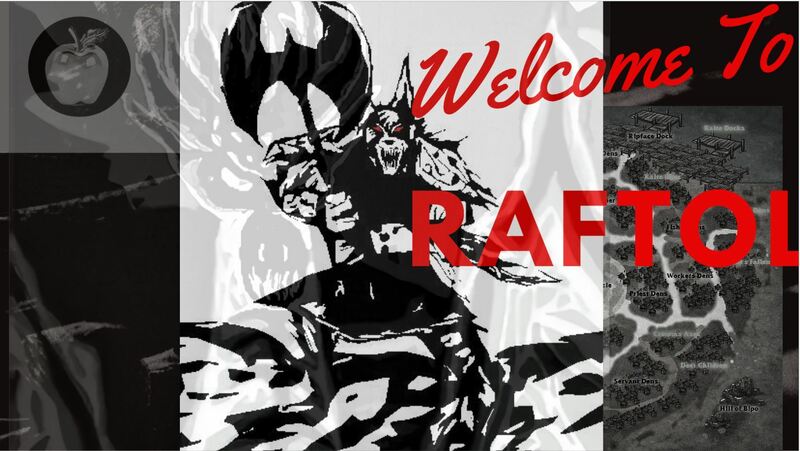 The lore, maps and npcs of Raftol continue to be built out but in the meantime feel free to use Raftol in your own adventure. 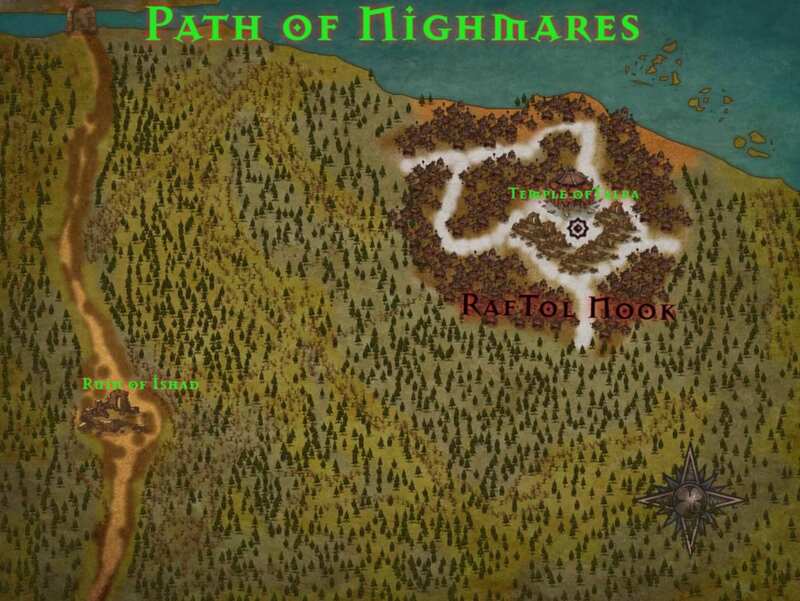 In the Path of Nightmares there lies a great bustling city of murderous Gnolls. It is unique for a few reasons notably because Gnolls normally do not build anything, much less a city. This is not a city of lights and wonders though, this is violent place of mud, and blood. It is built up by bones. Few non Gnolls have dared to enter the city and even fewer have returned. Most of what is known comes from the daring exploits of Rickard Hix who led a stealthy expedition inside the city and managed to make it out, alive. The following description of Raftol comes from his now famous journal. Crude is not an adjective I use lightly but it does not begin to describe the savagery of this city. This is truly as crude and savage of a place that I have ever explored. However, a city of Gnolls does hold its curiousities, and even enigmatic mysteries all buried beneath layers blood and bones. I went to Raftol expecting a nightmarish hellscape and on that front Raftol did not dissappoint me. It rises like a clawed hand against your senses, a festering, rotten wound upon the world. The Gnolls here are different than other Gnolls. They carry themselves slightly more upright than others. They manage to contain their inner violence to build and produce crude things. They speak in the tongue of Draconic and manage to do it well to the surprise and disbelief of all who hear it. This change in dialect and racial construction likely lies with theit Dragonlord SlumberRuin a Dracolich they have long served. Upon entering the city you will be greeted by thousands of dens made of mud and dung sprouting up like corrupted fungi. Twisted roads connect the dens without any apparent plan, they spread throughout the hovels like veins of angry rivers made of bones. The roads and any structure of substance are made of bones, bones of many untold, and unfortunate souls who happened upon this predatorial pit. The lone, sizable stone structure is at the center of the city, a large circular plaza, with a dias; A road with stone pillars seeping into the muck lead to it. Each pillar bears the markings of a previous more sophisticated culture that has been all but swallowed by the crude mud dwellings surrounding them. The pillars of the ancients whisper out promising a mystery but their whispers are drowned out in the mad howling of the legions of gnolls living around them. There is something here to be uncovered but only the most brazen and stalwart archeologist has a prayer of uncovering it in this wretched place. I would caution against traveling to this city. Even great warriors die here. This is a place of constant civil war that the locals call scrumms. They happen continually like a local sport. After each scrumm hundreds are left dead, or enslaved. Bodies don't last long in Raftol but rather they are absorbed with startling efficiency back into the city itself, the primary building blocks of its own creation being the dead of its own denizens. 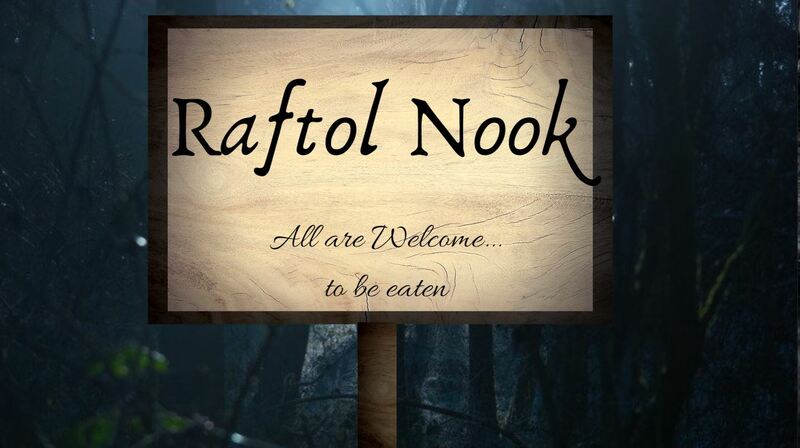 For this is Raftol Nook the city of bones. Some Dragonborn do manage to survive in this city. Most seem to worship the local Dragon lord SlumberRuin. They could be said to provide the city with a measure of sanity and reason. I would not however consider those that worship a Dracolich to be good or trustworthy folk however. They should be treated with equal caution as one would approach the insane Gnolls. If any credit can be given it is that these gnolls do make things. Ships float in its harbor, and leather and bone craftsmanship does exist in the city. The bone adorning the Gnoll dens is surprisingly detailed. Good luck trying to purchase items in this place though, and eating here is beyond precarious where you yourself are on the menu. The Population of Raftol was estimated by Rickard Hix to be between 3 and 5 thousand. Raftol is overwhelmingly a Gnoll city however the Gnolls have come to tolerate and even respect Dragonborn due to their worship and respect of Dragons. There is a group of Dragonborn who have come to the city as an act of patronage to the Dracolich SlumberRuin as well as to study the ancient ruins of the Ishadi. The Dragonborn in the city tend to belong to a religion known as the Draconic Triad that worships Tiamat, SlumberRuin and Kremarion. 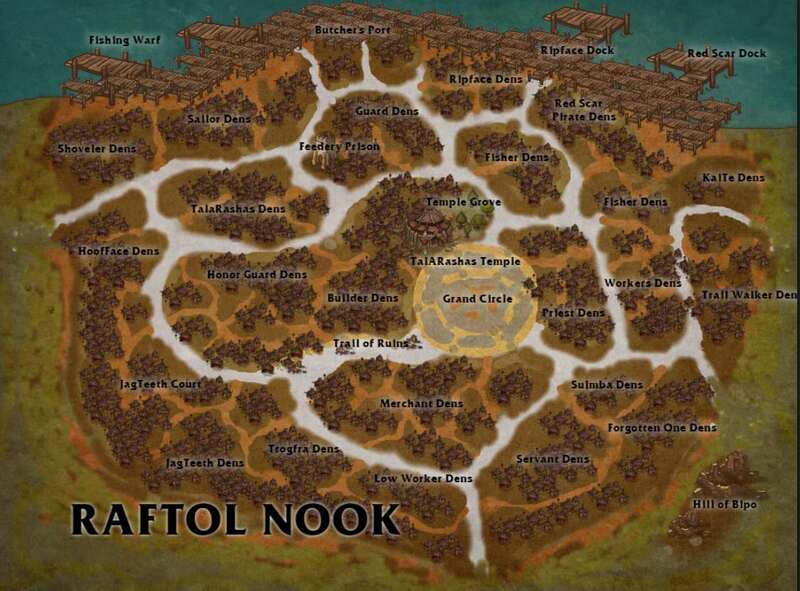 There are a small amount of Illithid and Drow traders dwelling in the Raftol Market place. Niether race is tolerated outside of this district and generally keep to their stores and use Draconic Gnoll surrogates to do business in the city. While not an intelligent race Hyenas are more than tolerated in the city and are considered like family members to many of the Gnolls. Packs of wild Hyenas roam the streets and guard many Den entrances. While stone and wood structures in Raftol are scarce Rickard Hix did note some complex structures in his expedition to Raftol. Notably Dens are homes of the Gnolls that were constructed using Mud but with added artistic decorations utilizing bones. The more complicated dens took on the motif of a screaming face and were a symbol of wealth and power in the city. Wealthy Dens also often bore the Spiralis symbol. They sometimes also had build in Panoramas showing various hunting scenes. By far the most popular Religion in Raftol is a form natural spirituallity. The faith has no form of organization and is without priests, churches or holy text but seems to be practiced devoutly by the bulk of the Gnolls of Raftol. Most assume that the Gnolls of Raftol owing their creation to SlumberRuin worship him as an act of gratitude. The concept of gratitude amongst Gnolls is almost unhead of so this is definetly not the case. 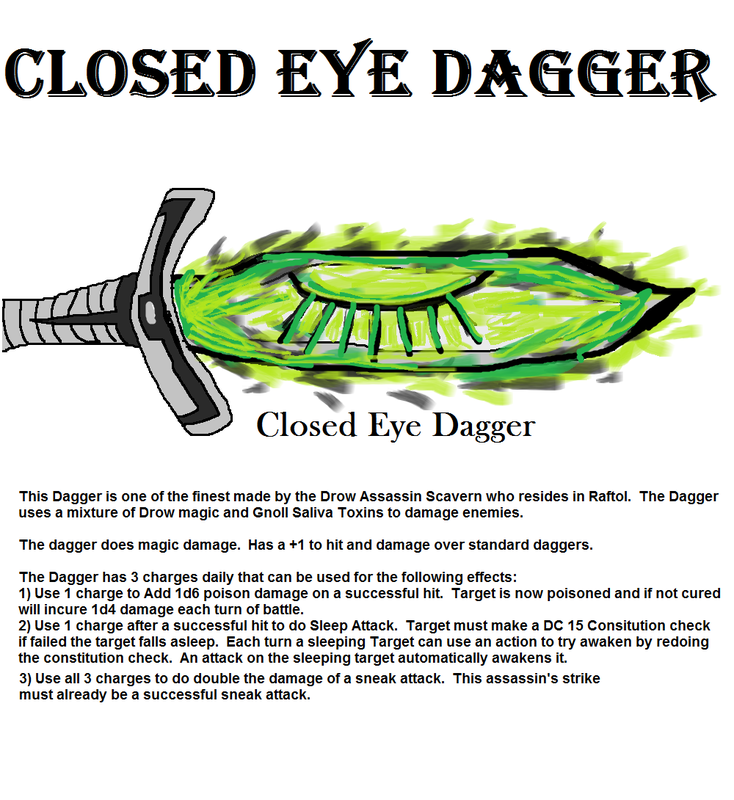 If anything to the Gnolls gifts are to be detested as a sign of weakness. The following of SlumberRuin is part of a surprising complex religion of the Gnolls called the Spiralis. The Gnolls worship the process of predation's effect on nature, and how it leads to strengthening of both predator and prey. They see the world locked into a kind of relationship where each will help the other become ever stronger. The bone construction of dens and trinkets is thus not only for practical purposes but also acts as a sign of worship toward the Spiralis. 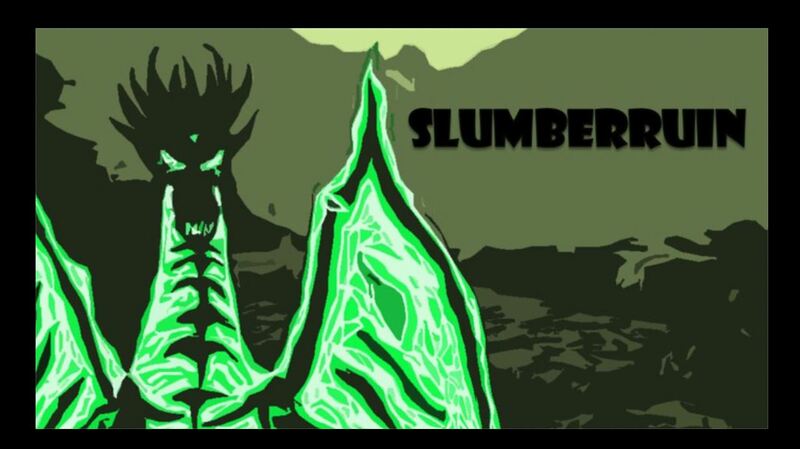 In their view the great predators, the strongest creatures all deserve their respect and to them SlumberRuin is simply the greatest and most powerful creature they have yet to encounter. 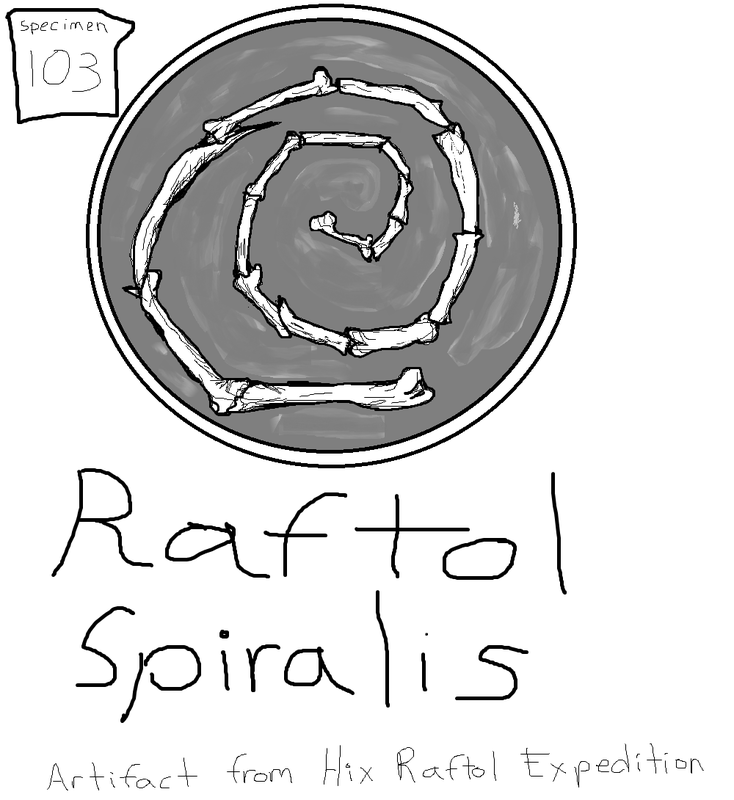 Signs of the Spiralis cover Raftol. Bone construction often contains a Spiralis symbol made of rib bones that begin with small bones and outwardly becoming constructed of larger bones. These bone pieces of hard can be hung from door ways in a form of trinket or constructed into Dens themselves. They are sometimes referred to as Ribcages of Strengthening as they show life getting stronger over time. Another form of art is the panorama of the hunt a vignette made of bone, or scupted from mud that shows that act of hunting a great beast. The Gnolls vernate great kills and the prey that gets away both are considered great acts toward the Spiralis. While the Spiralis has no priests or books Gnolls of the ideology seem comfortable with its major tenets of the hunt leading to an ever strengthening world. While other natural orders of the elves or druid see beauty in nature's balance, the Spiralis see beauty in nature's ability to change to favor the strong. Most religious philosophers who have studied it, see it as a chaotic natural religiou. There is disagreement amongst many whether it should be considered evil or good. The growing consensus among theologiians is that it is a neutral philosophy. The Triad is a religion led by the Dragonborn immigrants to Raftol but has managed to convert some of the Draconic Gnolls. The religion is also largely tolerated by the Gnolls as it shares a worship of SlumberRuin and Dragons within it. The Triad is the worship of the great dragon powers of Tiamat, SlumberRuin, and Kremarion. The Triad is led by a high priest who runs a powerful pack in the city called the Dragon Priests. The Dragon Priests ranks are made up of a mixture of Dragonborn and Gnoll Paladins and are considered to be one of the stronger and more deadly packs in the city. The Triad also maintains a small hide away in the Merchant Dens called the Black Skull Quarter where non Gnoll visitors can stay safely. The acting high priest of the Triad sacrifices one of his hands in a ritual. He then wears a variety of ancient prosthetic hands with magical properties. The most notable hands worn by the High Priest are the claw of SlumberRuin a large claw said to be imbued with necrotic energies and a bright metal hand called the hand of the Ishadi. The hand of the Ishadi is thought to have been made during the Ishadi empire. There is a subsect of Raftol that worships Demons. Gnolls in general owe their creation to the Demon Lord Yeenoghu. However, as mentioned in the Spiralis religion Gnolls care little for gratitude. Those that worship the Demons are more likely than not followers of the Spiralis who see the Demons as superior Predators than dragons. 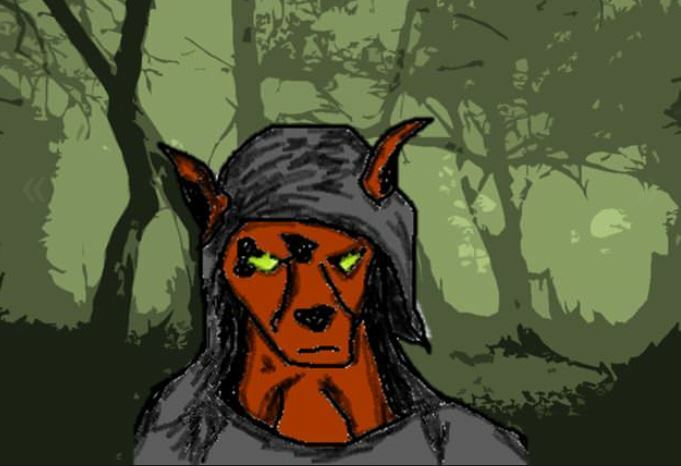 The Demons have sent many servants to convert the Gnolls back toward their worship but they have met stiff resistance from the followers of the Triad and Spiralis. It remains a taboo cult religion on the fringe of Raftol. The demoness TalArasha nearly took control of Raftol however she was slain by a group of heroes alled the Companions of the Silver Apple. 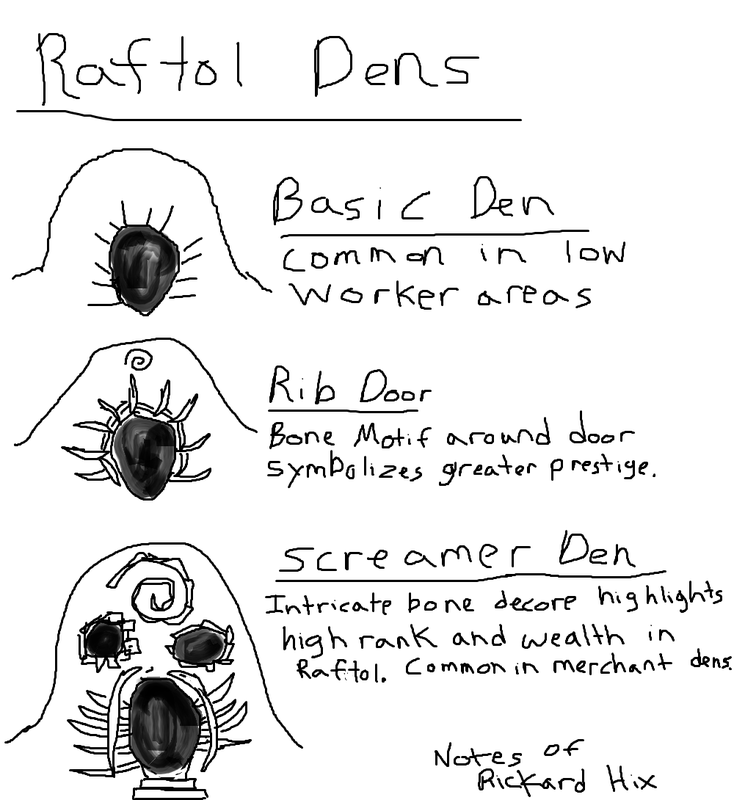 Most of Raftol is a series of Dens that house various packs that live in and control the city. Central Temple - In the central area of town is a large Temple complex built largely by the Dragonborn who inhabit the city. The Temple is designed to honor SlumberRuin the Dracolich who rules the city. The iconography in the temple honors what is referred to as the Triad of Dragon Power, Tiamat, Slumberuin and Kremarion The Temple also serves as the City's central government seat. The pack that holds the temple is viewed as the pack in control of the city. Temple Grove - Near the central Temple is a park with old trees. It is one of the few beautiful areas in Raftol. Grand Circle - A great plaza of intricate, precision cut stone work is front of the Temple. This great structure was not created by the Gnolls but by the ancient Ishadi Empire. The once white stone is know largely stained in hues gray and brown after years of abuse by the Gnolls. Butcher's Port - The port features two main docks that are fought after by various Gnolls packs who want to use them as a staging area for piracy. The Butcher's Port does feature two stores for the brave. Togs Tavern and Gulmugs Fish, both establishments accept Jellied Eyeballs for payment. 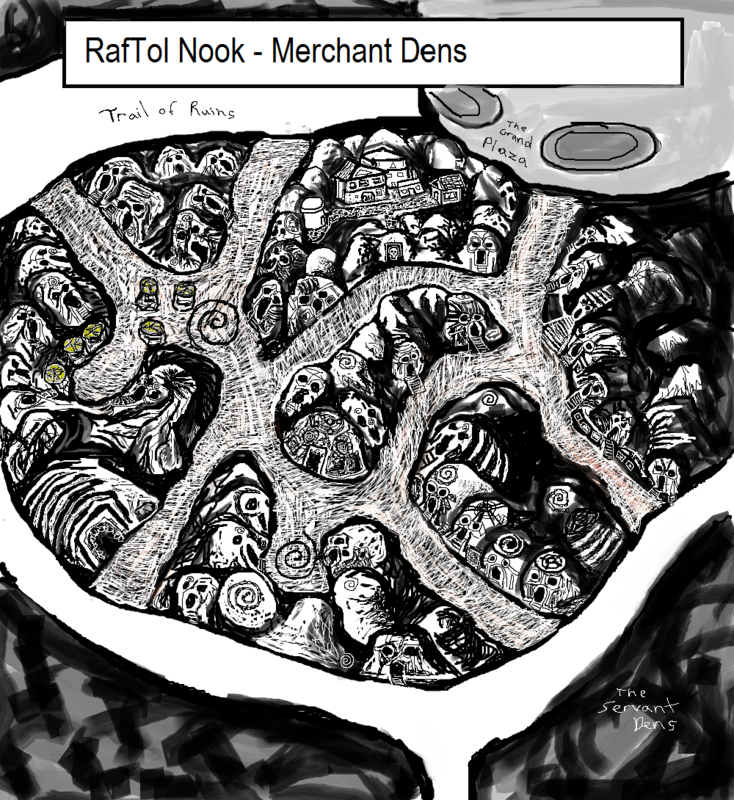 Merchant District- Many stores are here but most sell junk, foul meat and refuse from Gnoll hunts. However, hidden in the district are a few stores that adventurers may find useful Quas's Hut, Targon's Bone Trinkets, Rafeter's Wands, TSkarin's Tavern, Scavern's daggers, and Rattle's Zoo of Eats are highlights for the brave. 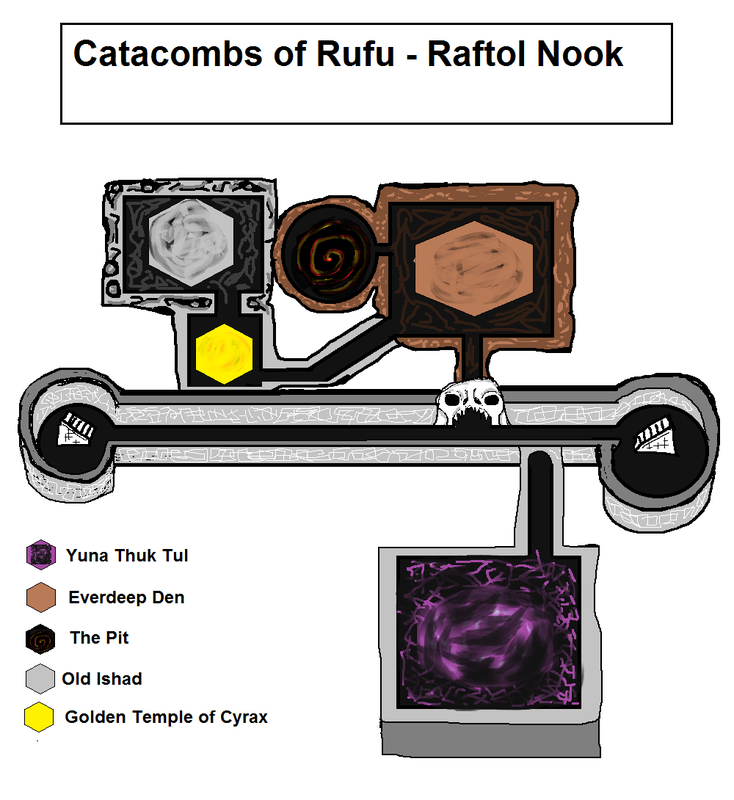 Rufu's Catacombs- Rufu was a Dragon Priest of some renound said to be one of the great founders of Raftol itself. He constructed a labryinthian set of corridors beneath the city that can be accessed in the Plaza itself. The Main Corridor is an epic tunnel of bones that leads beneath the river to Raftol's north. The structure seems to be entirely created by intricatly cut bones. Arcing out of the tunnel are various other tunnels. Many of these tunnels begin in the gaping maw of some great beast slain by ancient gnolls. One of the tunnels is a gate way to an Illithid outpost the Merg. The reason for the Illithid Outpost beneath the city is a mystery but it is one of the major trading partners of Raftol. 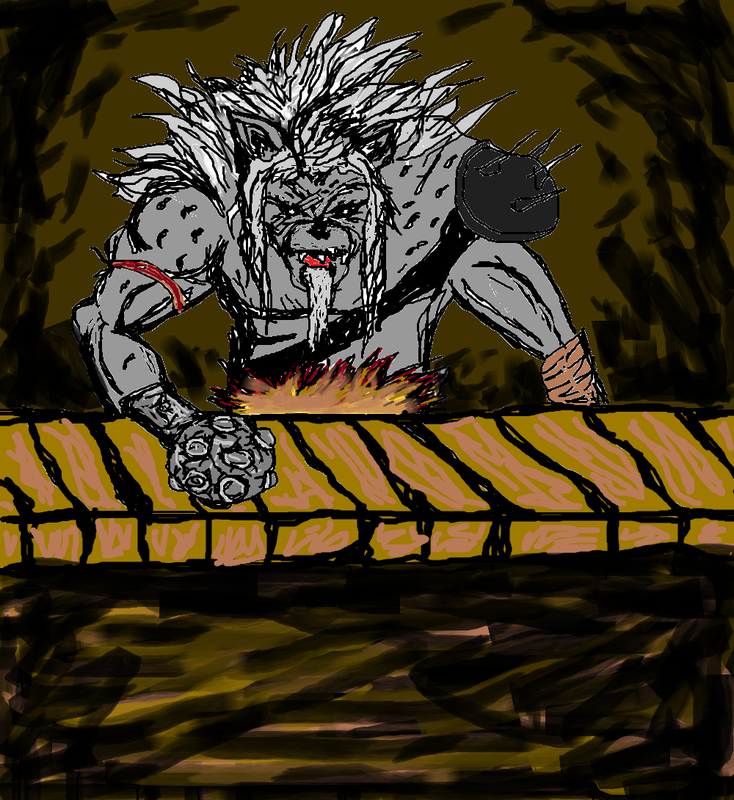 The Den Palace / The Ever Deep Den - The Legendary Gnoll chief Mulaboog was determined to never be destroyed in one of Raftol's many Scrumms so he dug, and dug and dug. For many years the followers Mulaboog created the great Den palace. Its top floors were full of trophies taken over many years of battling and hunting. The true claim to fame though was the depth of its tunnels that are said to never end. Eventually, Mulaboog did die, well most assume he did at least. The top floors of the Palace have been held by many packs but few have explored the depths of what has become knwon as the Ever Deep Den. The Den was most recently being held by TalArasha and is now held by Captain Braffra and is referred to as Braffra's Palace. The Dragon Priests have been offered the Den Palace numerous times but have always demurred it is possible they know something. Raftol is ruled by various packs who are constantly vying to control the city. A regular event in the city is called a Scrum in which different packs unite together to violently push out other packs from their dens. Generally, the most powerful packs tend to be located in the city center. The highest Overlord of the City continues to be the Dracolich SlumberRuin however he often sleeps or leaves the city to its own devices. For most of Raftol's history the central packs at the Triad Temple have led what limited central government the city has. 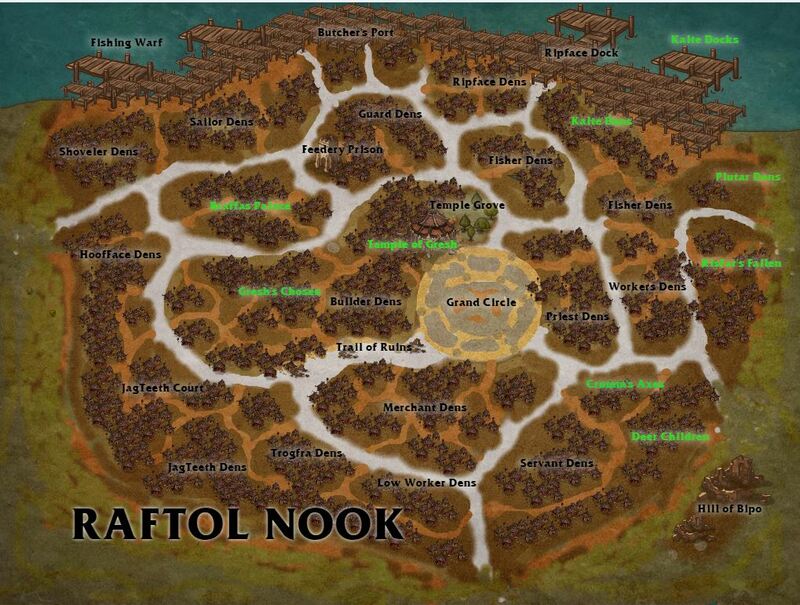 This location like most of Raftol only welcomes Gnolls are Dragonborn other's beware. Togs Tavern - Sell Grog heavily watered down Grog and RigityDig a menagerie of unidentifable meat. Tog's hosts nightly fights to death of various species in Gladiatorial combat. Gambling and bar fights are the norm here. It is possible to hire a Gnoll captain to sail the sea at Togs. Gulmugs Fish - One of the few places in Raftol where one can buy unpoisoned and identifiable food. Gulmug sells whatever Fish are brought out of the sea that day by Raftol's Fishermen. The fish is sold raw to patrons. The store is popular with the City's Dragonborn who tire of the unidentifiable meat commonly served in the city. The Merchant Dens are one of the safest locations in the city for a non Gnoll. What other races exist in the city other than the Dragonborn congregate here. There is a portion of the Merchant dens hidden behind a black Skull door in which many of the non-Gnoll businesses congregate. This area is known as the Black Skull district and is run by an Illithid Trader named Quas. Entertainment is found in fight clubs that line the streets around the Blood Bazaar. Outside of fighting the Gnolls turns to the Zoo of Eats run by a fierce Gnoll named Rattle. The most well heeled and intellectually gifted Gnolls maintain residence here. While many of the stores sell Rigity Dig meat, there are a few Gnoll stores that sell sails, and leather ropes that are of high quality. The Gnoll harvest what they hunt to the fullest and all parts of animals are transformed into a range of goods. These items can be purchased in the Blood Bazaar. The merchant district is also something of a holy site of the Spiralis religion. While the faith has no priests the artistic works of Targon are widely guarded as having a holy quality to them. His store's iconography also is the trend setter for the rest of the faith as far as acceptable art work. 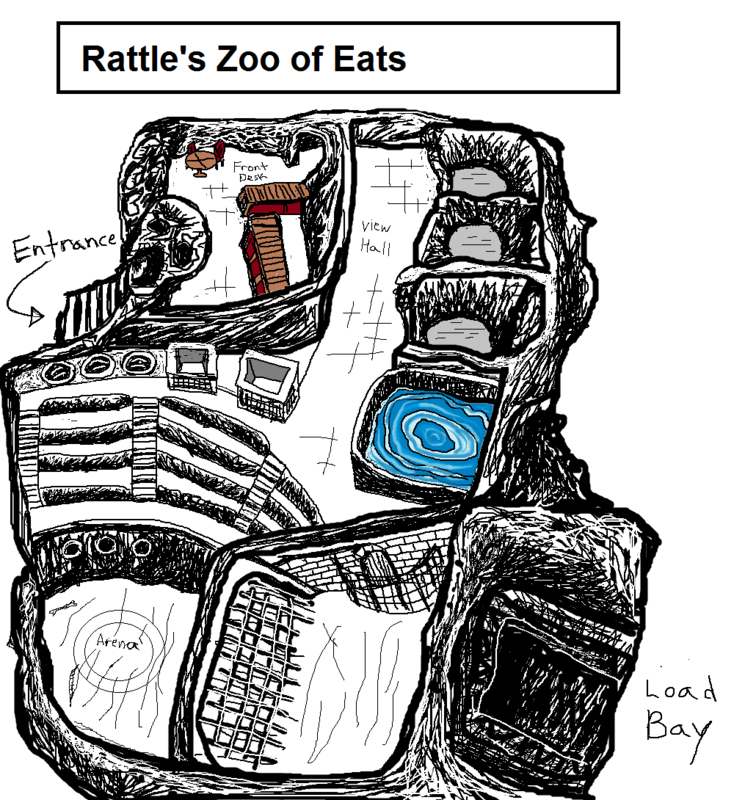 A) Rattle's Zoo of Eats - Rattle has many cages full of different beasts found by the Gnolls on land and sea. Come see the creatures and monsters, come see the wonders, come and see them eat! Pay more and eat them. Pay more and watch them eat someone else. Rattle gets his name from a prosethic piked arm that rattles as he shakes it. He is one of the older Gnolls in the city, which makes him something of a survivor. He is one of the few Gnoll merchants who will openly do business with non Gnolls and also knows of the existence of the Black Skull Quarter. His Zoo is one part mad house / freak show and one part restaraunt his hunters go out and bring back strange beasts for Gnolls to watch and to eat. This is a dangerous place but one of never ending entertainment for the Gnolls. Rattle himself is a dangerous person to deal with and made more dangerous by his deranged pack of guards led by the fierce warrior Gretchen Black Claw. 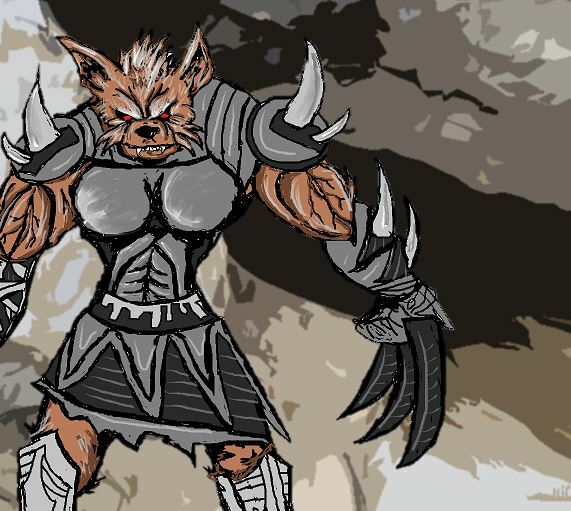 Gretchen has killed many a Gnoll and she keeps a close eye on the Zoo. If Gretchen was not bad enough Rattle also has 2 pet Gricks that watch after their master like a hawk. The Gricks are named Anna and Elsa and are treated like Princesses at the Zoo. Gretchen Black Claw has her eyes on you. B) Targon's Bone Trinkets - Targon sells bone trinkets and cutlery that can be traded throughout the world. Few are willing to make the trek to come here for them though but they are sought after. Targon's Spiralis door hangers are hung throughout doors of the city. The detailed bone artwork around his store is revered as something as a holy site for those of the Spiralis faith. C) Rafeter's Wands and Skulls - Rafeter is a rare learned Gnoll he maintains a gmall library and wand shop. His wares are all made of bone and carry various magic elements. Rafeter is considered to be Shaman of the Spiralis faith. E) The Black Skull Quarter - Is not widely known by the Gnoll population and is home to many of the bulk of the Non Gnoll Merchants of the city. 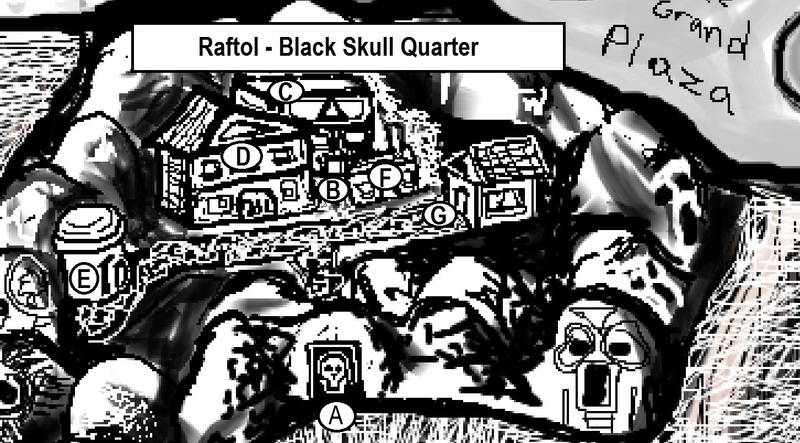 The Black Skull Quarter emits a smell that is horrible to Gnolls but smells like perfume to non Gnolls. In this way the Quarter subtely maintains its secrecy of being a non Gnoll haven for business and power brokers. The quarter is made more secure through a guarded Black Skull door that only opens for non Gnolls. Further security is provided by a division of Glass Eyed Gnolls. These are Gnolls that have been mind controlled by the Illithid Quas. They robotically maintain order in the quarter and keep out the dangerous gnolls of the city proper. While the Black Skull Quarter is not as immediatly dangerous as the rest of the city it is still inhabited by dangerous cut throats and mercenaries and is by no means safe. A) Black Skull Gate - Manned by four fierce glass eyed Gnolls under orders only to open the gate for non Gnolls. B) The Triad building houses the Triad Dormitory and Triad Supper Club on its top floor. A large group of dorm rooms run by the Triad priests. The rooms have no frills but by Raftol standards are luxurious due to their cleanlyness. The Triad priests do not require customers to be from the Triad religion but it does not hurt. C)Triad Supper Club - On top of the Dormitories is a restaraunt and bar called the Triad Supper Club. The club has some some of the best food in the city but one must be invited by a member to enter here. D) TSkarin's Tavern -One of the few places in Raftol where non-Gnolls can congragate and eat. 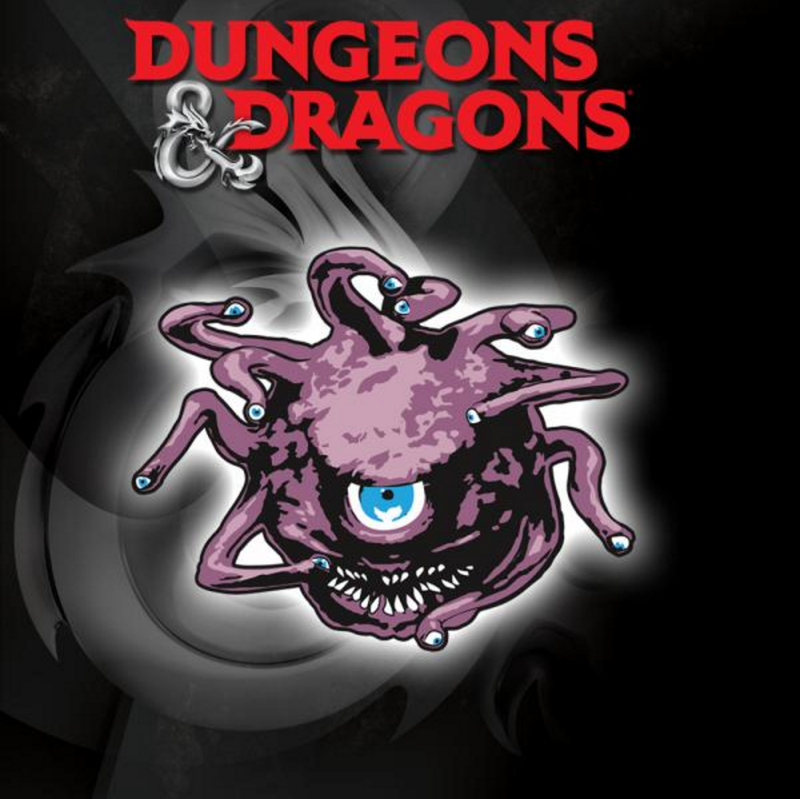 The Tavern is popular with Dragonborn, Kenku, Drow and the occassional adventurer. Even the Illithid's have been known to come to TSkarin's for a room or a bite to eat. TSkarin is a Drow friendly for his kind. 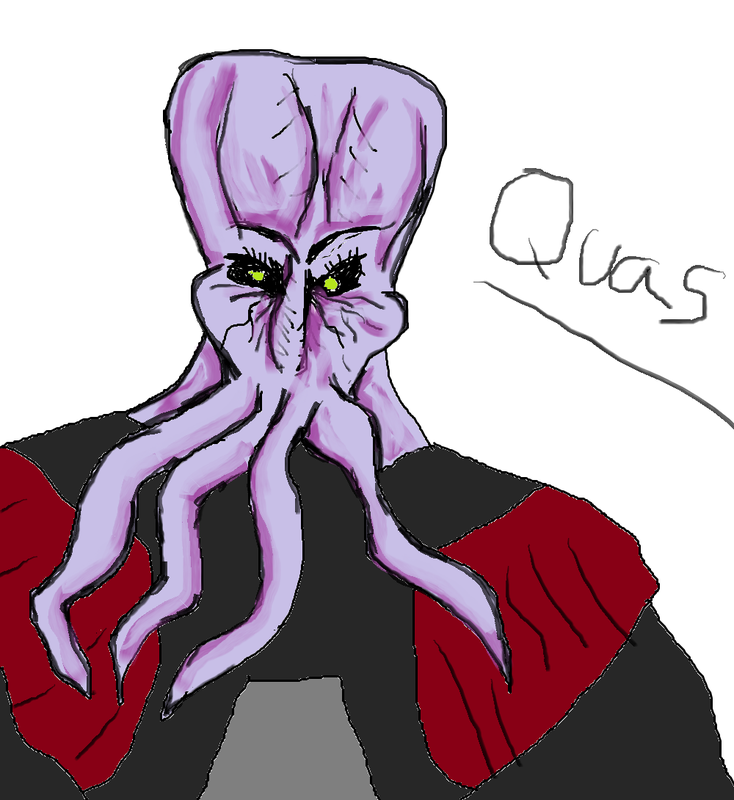 E) Quas's Hut - Quas Ordell is an Illithid merchant who sells Ustilagors, information and will also act as a money changer to provide Jellied Eyeballs. The Glass Eyed Gnolls who maintain order in the Black Skull Quarter are mind controlled by Quas. The cold Illithid gives nothng for free. 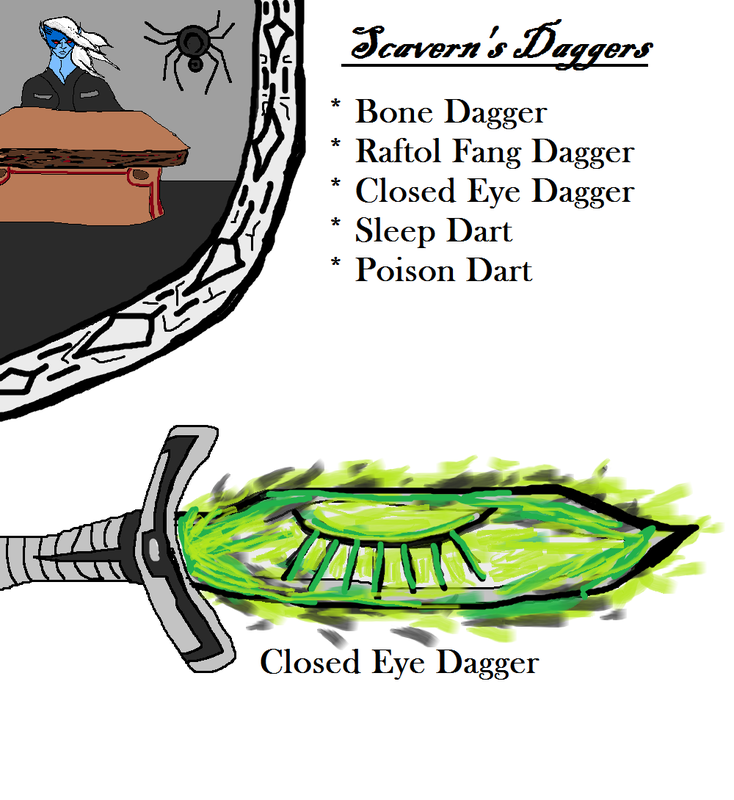 F) Scavern's Daggers - Fine and deadly bone daggers made by Gnolls and poisoned by Scavern a deadly Drow assassin who knows a thing or two about daggers. Scavern uses the Draconic Gnoll saliva as toxifying agent in his daggers. Scavern maintains the only metal forge in the city and can repair metal items as needed. G) Keran Smugglers - Group of Kenku smugglers who sell transportation services and information. They have a deal with the Ripface to transport goods in and out of the city. The Keran also maintain locations in Waterdeep and Luskan. The Keran sell passage of goods out of and into the city for a heavy price. The Keran also run a general store that is known to have horrible prices but occasional useful goods. Many years ago this location was home to an advanced Dragonborn civilization called the Ishadi. The Ishadi were led by a great Silver Dragon named Darlatan. The empire ascended quickly with many comparing it to the fabled Dragonborn empire of Arkhosia. The rise of the Ishadi was painfully short lived. Darlatan led successful campaigns against the evil Dragons and slew many. His cadre of Metallic Dragons grew and along with the Ishadi empire they began to feel invincible. An evil Blue Dragon that had been bested in combat by Darlatan named SlumberRuin had other plans. He used his knowledge retrieved by Vecna to trick Darlatan and turned the great Silver Dragon's Skull into his own Phylactery. 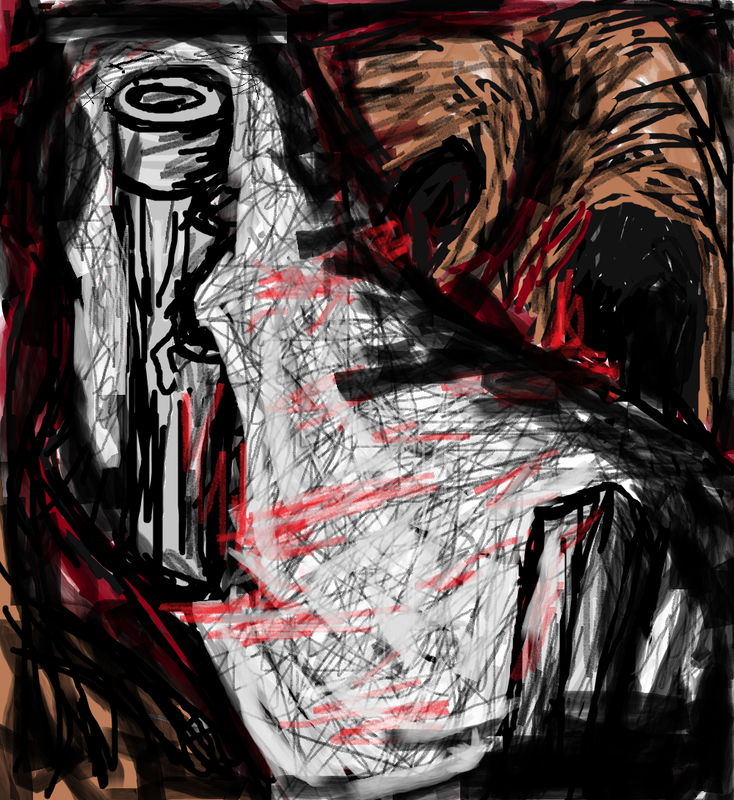 In very little time SlumberRuin created an army of undead and razed the Ishadi empire to rubble. Survivors of the city were few and it quickly was forgotten. What was left of the Ishadi empire became the lair of SlumberRuin and his dark magic oozed into the once great landscape and left it as tainted as his own black heart. SlumberRuin began to play with building up his own empire but the Dracolich was constantly thwarted by his own boredom and vanity and destroy anything of substance he created. Eventually, he discovered the Gnoll a creature that could never rise to the point where it could threaten up, but could worship him and meet the demands of his own narcism. SlumberRuin experimented on Gnolls fusing them with the blood of Dragons and making his Gnoll form the Draconic Gnoll. 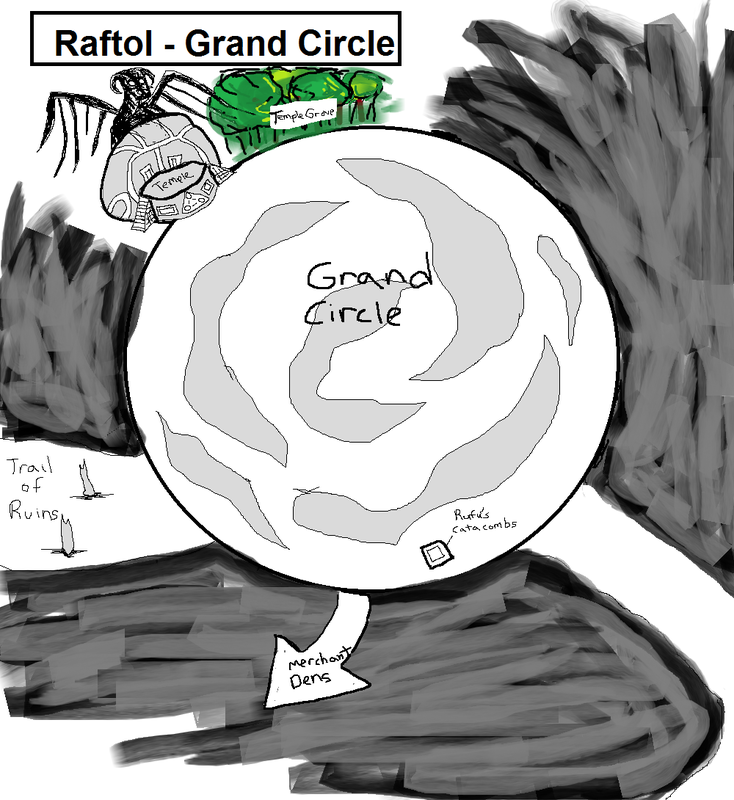 The Draconic Gnoll built a crude civilization upon the old Ishadi Ruin and named the place Raftol. The effect of the Companions of the Silver Apple on Raftol. The Companions were met with a predicament when the Gnolls of Rafol kidnapped their guide Galen Moonblade. They set out toward the city to retrieve him. Before the Companions arrived the city it was being taken over TalArasha a demoness who was pledged with returning the gnolls back to the worship of Demons and away from the worship of SlumberRuin. After the Companions defeated TalaRasha, many of packs were destroyed and dens changed hands. 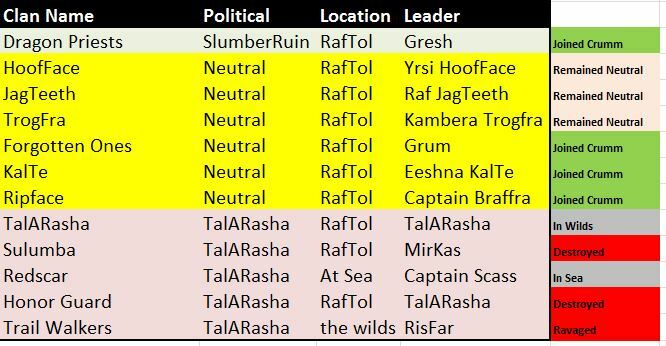 The Companions joined forces with the packs of the Dragon Priests, The Forgotten Ones, The Kalte, and the Ripface to topple those loyal to TalaRasha in a scrumm. The result of this was that the Dragonborn Gresh took control of the temple and the central areas of the City. The Kalte Took over the docks of the RedScar's. 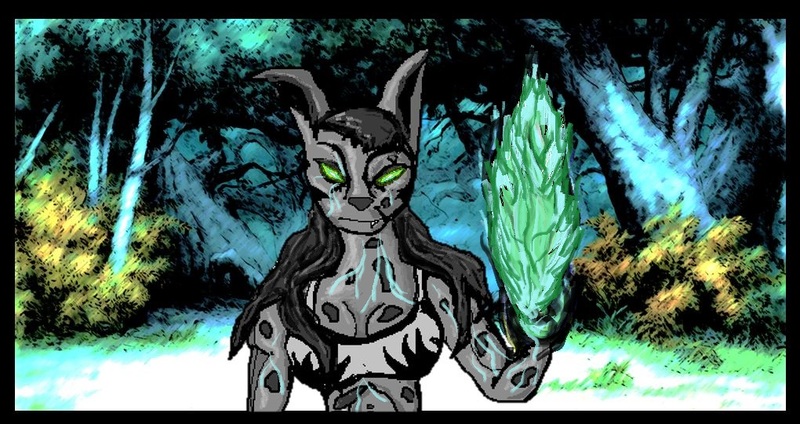 A new subservient pack of the Kalte Pack the Plutar took control of their old Dens. The remaining Trail Walkers were allowed to keep their old dens but were now called labeled with a deragatory label of Rifar's Fallen. The Forgetton Ones led by Grumm took over the Southern part of the City and turned it into 2 packs. Crumm's Axes led by Grumm himself and the best warriors of the Forgotten Ones. The other pack was the Deer Children led by Qasar and was a mix of low level Forgotten ones, Servants and survivors of Sulumba. The Ripface took over the Northern Docks and even some dens in the city Center. The old TalARasha dens were taken by Captain Brafa himself and named Bafra's Palace. After the Companions the City was now held by 5 primary powers. The Dragon Priests in the Center. The Kalte in the east. The Forgotten Ones now Crumm's Axes in the South and a lesser power of neutral unaffiliated house in the west was led by the Jagteeth. The Companions through maintain some relations with the leaders of these various packs. It is unclear how long if at all present political structure will last. Stay tuned for more updates from Toylab to see how the Companions of the Silver Apple on this terrible trek!